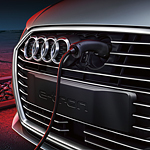 The E-Tron has a classic sportback body. Aerodynamic curves and sculpted lines help to redirect air as you drive, ultimately reducing drag. A subtle spoiler on the back completes the athletic profile. The lighting on the hybrid is sleek and modern. LED lights are used in the front and back. They're angular in design, further cementing that modern aesthetic. On the front, you'll find a Singleframe grille. It has horizontal slats and the iconic Audi logo covered in chrome. While it may look like a traditional grille at first glance, it's hiding a secret compartment. Behind the logo is the electric charging port. When the hybrid isn't plugged in, onlookers won't even know the port is there.